Home / David-Prowse / Ian-McKellen / Movies / Peter-Cushing / Poll / StarWars / XMen-Days-Future-Past / Poll: Who's the Best British Villain of All Time? Hailing Frequencies: Who's the best British villain in all of the genre? It's time for this week's poll and the new question. There have been many villains in movies, but the greatest are British. There's something about the accent that's so evil. Except Benny Hill of course. X-Men: Days of Future Past opened last week and features Ian McKellen as Magneto. He's been a favorite villain throughout the X-Men movies. But is he the greatest villain with a British accent? So here's the question: Who's the greatest British villain in all of sci-fi? Come back next week for the bi-weekly caption contest and comes back in two weeks for the next poll. Check the comments for why I chose Peter Cushing in Star Wars. 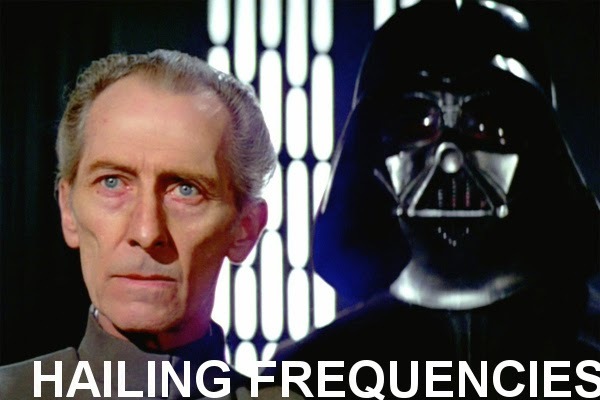 While Darth Vader is the most well-known villain in Star Wars Peter Cushing surpasses him in many ways. Cushing's performance was dripping with malevolence and evil. He was cunning, cruel and determined. His destruction of Alderaan is still the most evil act in "Star Wars." Hurm, yes, that is what they say in those Jaguar commercials. Though I can't consider Ben Kingsley that bad since he played Gandhi so even when he's playing an evil character I can't think of him as really evil. It was the same thing when Patrick Stewart played Scrooge; I couldn't really get behind him in the parts where he's being a jerk because he's Captain Picard and Professor X. But anyway Peter Cushing is a good choice since he blew up a whole freaking planet without batting an eyelash. Though I think my final answer is the guy who played Emperor Palpatine. What was his name, Ian Mcsomething? I mean blowing up a planet is evil but this guy engineered a whole massive war just so he could take over the galaxy. Then he sends his own apprentice to kill the apprentice's son and when that fails fries his apprentice's son with Force lightning right in front of him. At least Monty Python doesn't sound evil! I'll go with Angela Lansbury - Manchurian Candidate. I don't feel her villainous character gets enough love. She had one of the best death scenes ever in the movie. Alan Rickman. Is this really a question? Good one Tim. Ironically enough I almost went with her. She looks so sweet in “Murder She Wrote” it’s jarring to see her as a villain. I know what you mean about Kingsley Pat. If it hadn’t turned out he was a #REDACTED SPOILER# I wouldn’t have believed he was evil. It’s like in “Last Action Hero” when the guy played Mozart’s killer so the kid knew he was evil. Ian McDormid is evil Man. He pretty much does the worst things you can imagine. Alan Rickman is awesome Tony! He puts others to shame.